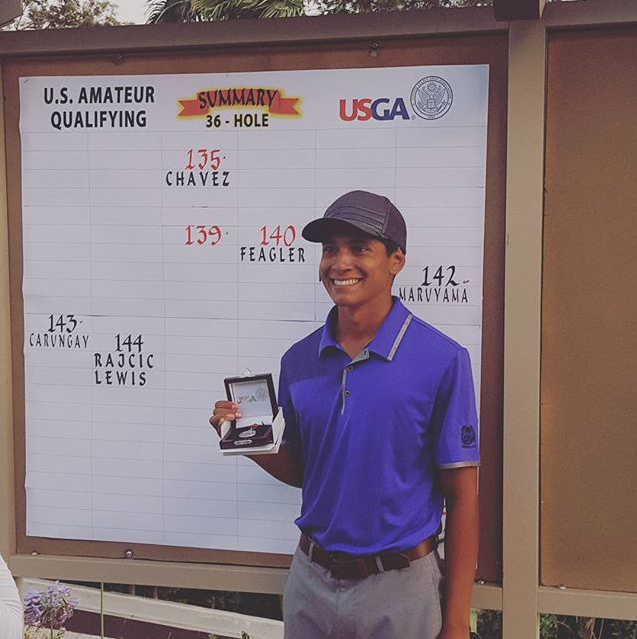 For the 4th year in a row, Hacienda Golf Club will send one of its own to the United States Amateur Championship. This is the most prestigious event in all of amatuer golf, and it takes a very high level golfer to make it there. Last week, employee, Cory Chavez, 22, qualified at Hacienda by shooting 66-69 for a total of -7. He finished at the top of the field by 5 shots. This is not the first time this event will have someone from Hacienda participating. Members Austin Amaya, Kyle De Silva and Ryan Tetrault have all qualified at their home course before. Austin has qualified once, Kyle twice and Ryan a total of three times. As an employee, Cory’s accomplishment stands out from the rest. While he spends many hours at Hacienda, he only gets to play the course once a week if he is lucky. He has worked in the bag room for 3 years, and has become one of the members’ favorite staff. Web.com tour pro, and honorary member, Mark Anguiano notes, “I think Cory is a very deserving qualifier and is more than worthy of competing out there next week. I think his hard work and determination will pay off for him. I know this because he caddied for me in Q school last year and did an excellent job. I knew I could trust him with reading tricky putts or figuring out different shots. Best of luck to him at the U.S. Am. We will all be rooting for him.” Among other skills, Cory knows how to regrip clubs, and is also is a host for prospective members who come to Hacienda to play preview rounds. He is friendly and knowledgable about the game, not to mention an extremely hard worker.